PLEASE JOIN US TONIGHT AND PAY AT THE DOOR CASH OR CHECK. REGISTRATION IS CLOSED. Enjoy an evening of sampling, sipping, and mingling! 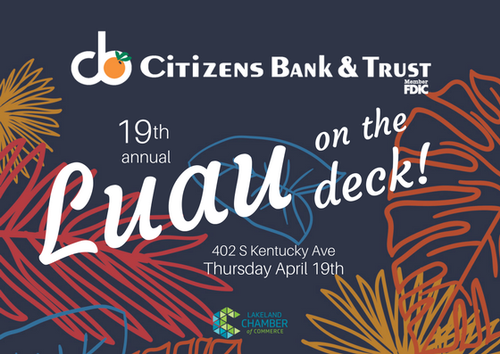 Every April, Citizens Bank & Trust hosts the Luau, held "on the deck" at Citizens Bank & Trust Downtown, to celebrate and thank loyal investors. This year, the Lakeland Chamber and Citizens Bank & Trust celebrate our 19th year! A party atmosphere, with food samples, live music, photo booth by Well Done Events, and complimentary beverages courtesy of Bernie Little Distributors and Tucker's Southside. The highlight of this event is the crowning of the King of the Wings in two categories, Judges' Choice, and Peoples' Choice. Winners display trophies at their location for one year, until the next Luau event. The Judges' Choice is determined by seven judges that will vote on three categories: appearance, flavor, and tenderness. The restaurant with the highest score in all categories, will be crowned the 2018 King of the Wings - Judges' Choice. Additionally, the 2018 King of the Wings - Peoples' Choice is determined by popular vote - with each guest able to cast his/her vote.